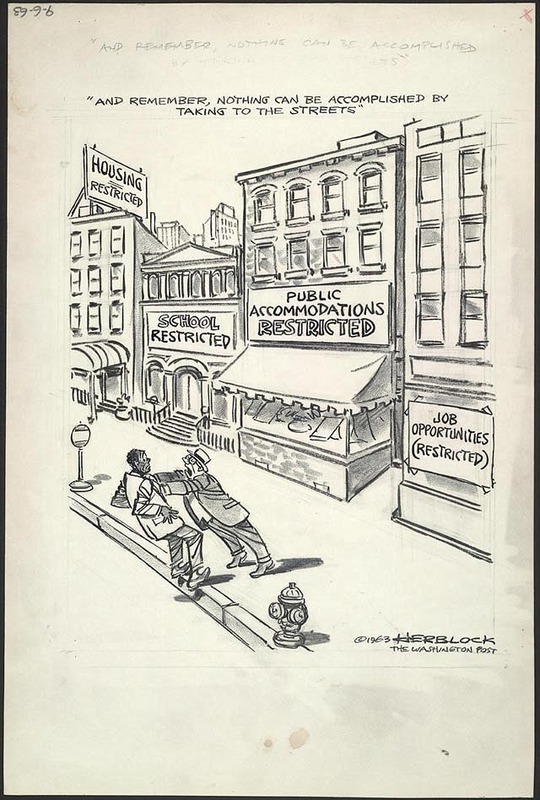 These images are from the work of Herb Block, noted Washington Post cartoonist. To learn more about him and his work do a quick read of the Wikipedia article below. Herbert Lawrence Block, commonly known as Herblock (October 13, 1909 – October 7, 2001), was an American editorial cartoonist and author best known for his commentary on national domestic and foreign policy from a liberal perspective. While in high school and then in college he began drawing some cartoons for the Evanston News-Index, mainly for the pleasure of being published. 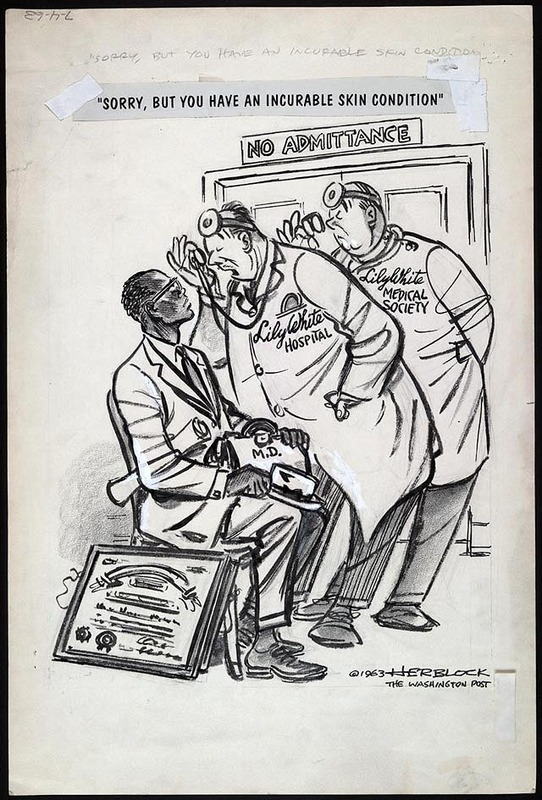 Toward the end of his second year at Lake Forest, he took some of these published cartoons and some unpublished ones to the Chicago Daily News hoping to get a summer job. The editor who looked at them said they would get in touch if they had anything. A few days later they phoned and asked Block to come in. An editorial page cartoonist was leaving the city and they could give him a try. He started Monday and never went back to school. His first cartoon appeared in the Chicago Daily News on April 24, 1929. It advocated the conservation of America’s forests. Herblock said that his family was conservative and that his father voted for Herbert Hoover in 1928. But with the onset of the Great Depression, he became a supporter of President Franklin D. Roosevelt and the New Deal, becoming a lifelong liberal Democrat. He pointed out the dangers of Soviet aggression, the growing Nazi menace, and opposed American isolationists. While he criticized Stalin and other communist figures, he also believed that the United States was overreacting to the danger of communism. In the early 1950s, Senator Joseph McCarthy was one of his recurring targets, for whom Herblock coined the term “McCarthyism” in a particular cartoon in 1950. He won a second Pulitzer Prize in 1954] The Washington Post officially endorsed Eisenhower in the 1952 presidential election. 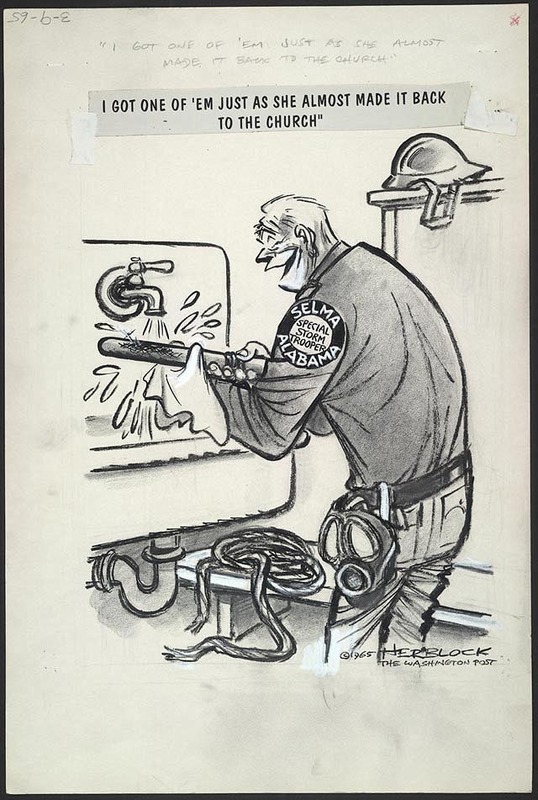 Because Herblock supported Adlai Stevenson, the Post pulled his cartoons, but restored them after a week. He always insisted on total editorial independence, regardless of whether or not his cartoons agreed with the Post’s stance on political issues. As a lifetime Democrat, he focused most of his attacks on Republican figures, but Democrats who displeased him were not immune from criticism. As an example – despite being an ardent admirer of FDR – he found it necessary to attack the president’s 1937 court-packing scheme. During the ’50s, Herblock criticized Eisenhower mainly for insufficient action on civil rights and for not curbing the abuses of Senator McCarthy. In the following decade, he attacked the US war effort in Vietnam, causing President Johnson to drop his plans of awarding the cartoonist with a Presidential Medal of Freedom. The cartoonist would eventually be awarded this honor by Bill Clinton in 1994. 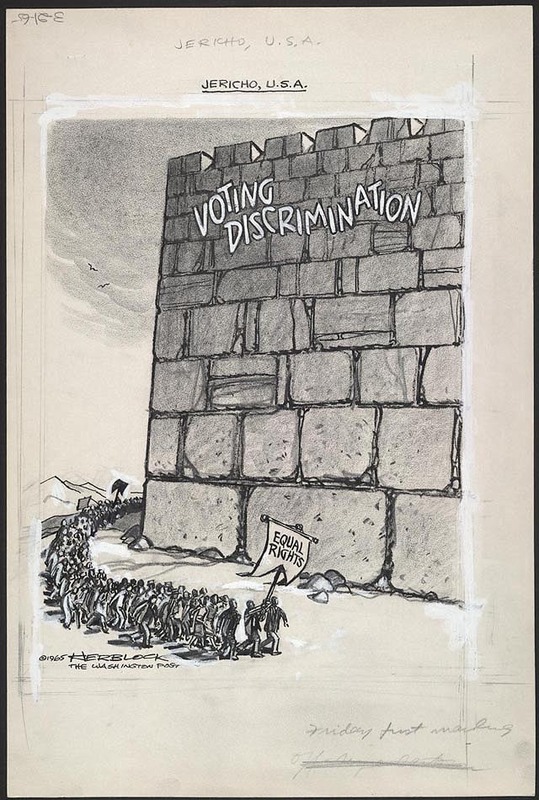 Some of Herblock’s finest cartoons were those attacking the Nixon Administration during the Watergate Scandal, winning him his third Pulitzer Prize in 1979. Nixon canceled his subscription to the Post after Herblock drew him crawling out of an open sewer in 1954. He had once used the same motif for Senator McCarthy. He also ended up on the president’s infamous enemies list. In the ’80s and ’90s, he satirized and criticized Presidents Reagan, George H.W. Bush, and Clinton in addition to taking on the issues of the day: Gun control; abortion; the influence of fundamentalist Christian groups on public policy; and the Dot Com bubble. The tobacco industry was a favorite target of Herblock, who had smoked at one time. He gave it up and had criticized cigarette companies even before that. Stating that he never got tired of his work, Herblock continued as the 21st century began by attacking newly-elected president George W. Bush. He died on October 7, 2001 after a protracted bout of pneumonia six days short of what would have been his 92nd birthday. His illness prevented him from drawing any cartoons about the September 11, 2001 terrorist attacks. His final cartoon appeared in the Post on August 26. During the course of a career stretching into nine decades, he won three Pulitzer Prizes (1942, 1954, 1979), the Presidential Medal of Freedom (1994), the National Cartoonist Society Editorial Cartoon Award in 1957 and 1960, the Reuben Award in 1956, and the Gold Key Award (the National Cartoonists Society Hall of Fame) in 1979. In 1986, Block received the Elijah Parish Lovejoy Award as well as an honorary Doctor of Laws degree from Colby College. In 1999 he received an honorary Doctor of Arts degree from Harvard University. In 2008 Herblock’s work was the subject of exhibitions entitled Herblock’s Presidents at the Smithsonian Institution‘s National Portrait Gallery (United States), and Herblock’s History at the Library of Congress. 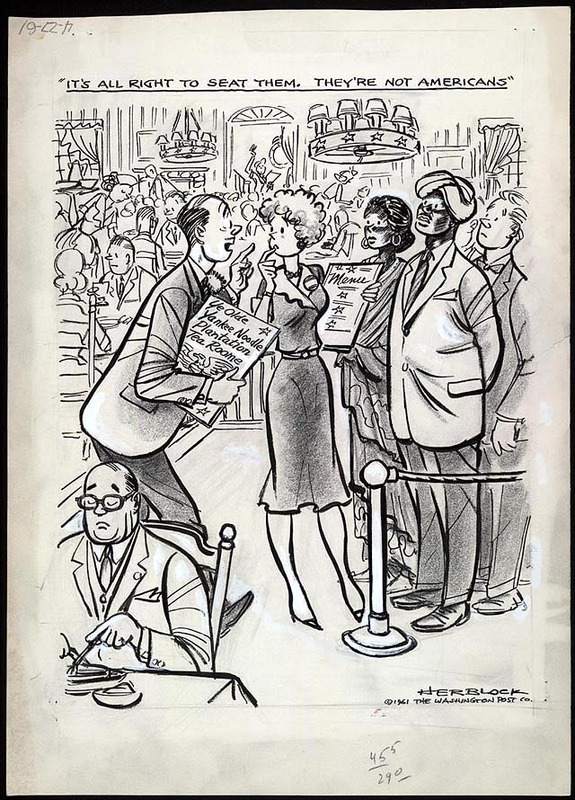 In late 2009 and early 2010, the Library of Congress showcased a new exhibition called Herblock!. This exhibition included cartoons that represented Block’s ability to wield his pen effectively and artfully. He used it to condemn corruption and expose injustice, inequality, and immorality. His topics included the Great Depression; the rise of fascism and World War II; communism and the Cold War; Senator Joseph McCarthy; race relations; Richard Nixon; the Reagan era; the 2000 election and more.